The most wonderful time of the year is fast approaching and for its seventh year, Syfy is bringing us its 31 Days of Halloween programming line-up. This year will feature not only new original movies, but also the 200th episode of "Ghost Hunters" and a new docuseries, "Town of the Living Dead." The full press release fills us in on all of the programming details, including info on its new zombie series from the production company that unleashed a "Sharknado," The Asylum's "Z Nation." 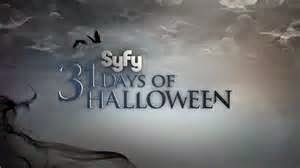 Syfy’s 7th annual 31 Days of Halloween spook-a-thon (October 1-31) will unleash 600 hours of spine-tingling programming including the premiere of the docuseries Town of the Living Dead (October 7); the 10th anniversary – and 200th episode – of Ghost Hunters (October 8 and October 22), and three terrifying Original Movies Dark Haul (October 4), Dead Still (October 6) and Finders Keepers (October 18) – starring Tobin Bell, “Jigsaw” from the iconic Saw franchise. Among the blood-curdling theatrical movie premieres airing during this year’s scarefest are Shutter (October 5) and the remake of The Texas Chainsaw Massacre (October 11). A team of secretive guardians transport a deadly creature and its half-human sister to a secure location, but the beast escapes and threatens to fulfill a prophecy – by destroying the world. Dark Haul stars Tom Sizemore (Saving Private Ryan, Black Hawk Down), Rick Ravanello (The Cave, Hart’s War) and Evalena Marie (Remains, Serena and the Ratts). Dark Haul is a production of Synthetic Cinema International. Wedding photographer Brandon Davis (Ben Browder/SG-1, Farscape) inherits an antique camera famous for taking Victorian death photography. When he uses it, the subjects die, then reappear as eerie death portraits, leading Davis into a terrifying journey to uncover the haunting mystery behind the cursed camera. Dead Still also stars Ray Wise (Twin Peaks, Jeepers Creepers) and Gavin Casalengo (Noah, When The Game Stands Tall). A Booth Brothers Film, Dead Still is a production of Plus Entertainment, Hollywood Media Bride, Twintalk Entertainment and Spooked Productions. The colorful folks of Jasper, Alabama are determined, once and for all, to complete their zombie movie, Thr33 Days Dead… now six long years in the making. Based on a town urban legend, their film centers on a group of friends trying to survive a zombie apocalypse in rural Alabama. The series will follow the intrepid and motley crew of amateur filmmakers as they struggle against every obstacle imaginable to get to a final cut of their film…which could someday become a Syfy movie. The production company is True Entertainment (The Real Housewives of Atlanta, Season 25: Oprah Behind the Scenes). Executive producers are Glenda Hersh, Steven Weinstock, David Stefanou, Todd Hurvitz, Tony Biancosino and Cherie Kloss. This October, Syfy’s longest-running unscripted series, Ghost Hunters, celebrates two landmark events: Its 10th anniversary and its 200th episode. The 10th anniversary episode, airing October 8, sees Jason Hawes and the TAPS (The Atlantic Paranormal Society) team traveling to Brunswick, GA’s Old City Hall to investigate claims of paranormal activity said to be sparked by a 19th century shooting death. On Wednesday, October 22, Ghost Hunters marks the occasion of their 200th episode with a two-hour episode that has TAPS returning to one of their favorite haunted locations – the Trans-Allegheny Lunatic Asylum in Weston, WV. Additional new Ghost Hunters episodes airing in October take place at: Elizabeth V. Edwards Elementary School in Barnegat, NJ and the historic Clay County Courthouse in Green Cove Springs, FL (airing October 16); and Ohio’s Cincinnati Music Hall (October 29). Executive producers are Craig Piligian, Mike Nichols, Thomas Thayer and Alan David. A child becomes obsessed with an evil doll left behind by the previous occupants of her new home. Finders Keepers stars Tobin Bell (Saw, Saw II), Jaime Pressly (My Name is Earl, Two and a Half Men), Marina Sirtis (Star Trek: Next Generation, Crash) and Patrick Muldoon (Starship Troopers). A production of ARO Entertainment.